Tangmere solar farm was one of the first in the country to be owned and operated by a local authority when it opened in 2015. Built on 25 acres of a disused airfield on the outskirts of Chichester in West Sussex, the 18,000 solar panels produce approximately 5,000 MWh of clean electricity every year, which prevents an estimated 2,000 tonnes of CO2 from being released into the atmosphere. 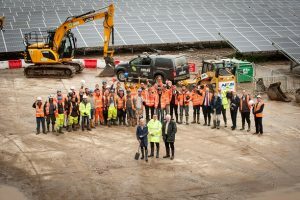 It also generates £13.8 million from feed-in-tariffs and electricity sales over the lifetime of the project and will pay back the construction cost in less than ten years. Some of the electricity generated at Tangmere is used by West Sussex County Council to power its buildings.